FIONA HUNT has been a practicing solicitor for 20 years. 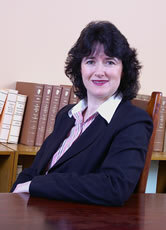 She also holds a Diploma in European Law from UCD and is a full member of the Chartered Institute of Arbitrators. Fiona specialises in Civil Litigation with particular emphasis on personal injury litigation. This includes personal injury claims arising out of road traffic accidents, accidents at work and medical negligence claims. As well as providing court representation for District Court family law cases in respect of claims for maintenance, access and custody and domestic violence cases, Fiona also provides a service for general family law matters such as Separation Agreements, proceedings for Judicial Separation and Divorce. Fiona's long years of experience practicing as a solicitor have resulted in good communication skills and ability to listen, inform and advise clients.